Mega Sale! 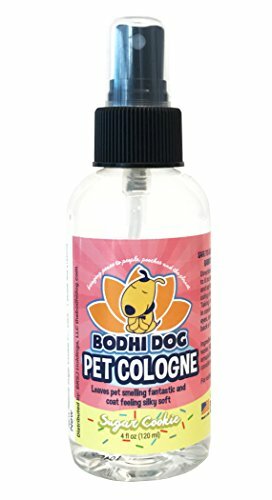 Save 26% on the New Natural Sugar Cookie Pet Cologne | Cat & Dog Deodorant and Scented Perfume Body Spray | Clean and Fresh Scent | Natural Deodorizing & Conditioning Qualities | Made in USA - 1 Bottle 4oz (120ml) by Bodhi Dog at People For Pets. Hurry! Limited time offer. Offer valid only while supplies last. Our natural pet freshner spray makes a great gift for a pet lover, it immediately controls odor and keeps pets smelling great and soft to the touch. Our natural pet freshner spray makes a great gift for a pet lover, it immediately controls odor and keeps pets smelling great and soft to the touch. There is no rinsing or washing required, simply spritz from the convenient travel size bottle and go! Our formula is safe, non toxic and does not affect flea and tick treatments. To use, hold bottle 6 to 8 inches from coat and spritz your pet lightly using short bursts. Taking care not to come in contact with pet's eyes, spritz from the back of the head to tail. For best results, brush afterward to evenly disperse product through coat. We are a small family owned business committed to your full satisfaction, LOVE OUR PET COLOGNE OR GET YOUR MONEY BACK! We are committed to the planet as much as we are you and your pet's happiness. PLEASE NOTE: The sugar cookie scent is subjective and there are no actual sugar cookies in the cologne. Our pet cologne and packaging are made using the most socially responsible and eco-friendly methods available right here in the USA. Bodhi dog products are the CONSCIENTIOUS AND SOCIALLY RESPONSIBLE PET OWNER'S CHOICE! MADE IN THE USA. LEAVES YOUR PET SMELLING FANTASTIC: Snuggles and cuddles from your furry friend never smelled so good! A quick spritz of our pet cologne gets rid of offensive odor without being overpowering. Don't have time for a bath? Our pet fragrance spray instantly controls stinky, smelly pet odors caused by being wet, musky, musty and outside in the yard or playing with other pets. Use every few days as a part of a complete grooming routine to maintain a pleasing pet smell in between baths. DELICIOUS SUGAR COOKIE SCENT: Our Sugar Cookie spray is the ultimate pet pamper treatment! A few spritzes will have your beloved fur companion smelling like they just came from the grooming day spa. Good riddance to stinky, strong, smelly pet odor! Our Sugar Cookie scented pet perfume will envelop your pet's coat, leaving it smelling sweet like a precious bouncing baby! VET AND GROOMER RECOMMENDED: Our pet perfume offers safe, professional, quality for dogs, cats, puppies, kittens, ferrets, guinea pigs and rabbits of all ages with normal or sensitive skin. Its suited for all types of fur. We stand behind the quality of our products with a 100% MANUFACTURERS MONEY BACK GUARANTEE. LEAVES COAT SILKY SOFT: Our pet cologne formula also contains natural conditioners giving it the added benefit of detangling and conditioning your pet's fur. It won't leave a residue or sticky mess like some lesser quality products do. Simply spray and brush to reveal a great smelling and softer coat. OUR ETHICAL FAMILY COMMITMENT: Proudly made in the USA using socially responsible practices, locally sourced and sustainable ingredients, animal cruelty free production and eco-friendly recyclable packaging. 100% Money Back Guarantee! If you don't love our Pet Fragrence let us know and receive a full, no questions asked refund. We are a small family owned business of pet lovers committed to making great products that are safe for you, your pets and the planet!